Fresh from completing its DoubleClick acquisition, Google is out with a new product called Ad Manager, a free solution designed to manage online ad sales and network-based inventory. In English, it will help Web publishers more freedom and control over their ads. The Wall Street Journal reports Ad Manager is Googleâ€™s weapon of choice to target publishers with small- to medium-size sales forces. DoubleClick, on the other hand, is aimed at bigger sites. More than that, it will broaden its offerings to include videos, graphical displays, and text ads. Aside from being free, which is the usual main talking point, Google claims Ad Manager has a very simple and intuitive user interface with simplified tagging and inventory management. Some of its key features include ad targeting, yield optimization, and multiple reporting options. Currently, there are few sites testing the Ad Manager service and so far garnered some favorable reviews. Despite some speculations that Google will offer DoubleClick for free, a company spokesman said there are immediate plans on this. Will Google-DoubleClick Merger cause online advertising bottleneck? Scott Cleland, President of industry research and consulting firm Precursor, has testified before the Senate Judiciary Subcommittee on Antitrust, Competition Policy and Consumer Rights and recommended the panel oppose the proposed Google-DoubleClick merger. He explained that the Google-DoubleClick merger would create extreme market concentration and “tip” the online advertising market, the economically critical market which is the only proven monetization engine of Internet content, to a bottleneck. Details of his insights can be found at Googleopoly.net. “The combined Google-DoubleClick would have no effective checks and balances and little accountability to consumers, competition, regulators, or third-party oversight,” Cleland said. “The facts and evidence will prove that a Google-DoubleClick merger would effectively combine the #1 and #2 Internet user audiences, content provider networks and advertising client bases — enabling Google to effectively ‘corner’ the online advertising market for consumer click data, ad-performance tools, ad-brokering and ad-exchanges,” predicted Precursor President Scott Cleland. Eight of the current top 10 grossing movies at the box office, based on the latest figures released by Box Office Mojo, are leveraging rich media services and technology provided by DoubleClick Inc., provider of digital marketing technology and services, to reach their target audiences online, the company announced. Through the use of DoubleClick Rich Media and Video technology, movie studios are able to create, serve and measure the effectiveness of interactive online video advertisements that make use of the latest in rich media technology such as live streaming, in-banner video and dynamic data feeds. 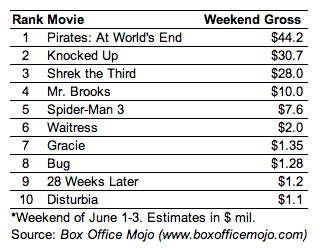 Box office hits that have tapped the services of DoubleClick Rich Media and Video include Buena Vista Pictures Distributionâ€™s Pirates of the Caribbean: At Worldâ€™s End, Universal Pictures Distributionâ€™s Knocked Up, Paramount Picturesâ€™ Shrek the Third, Sony Picturesâ€™ Spider-Man 3, Lionsgateâ€™s Bug, as well as 20th Century Fox Distributionâ€™s 28 Weeks Later and Fox Searchlightâ€™s Waitress. Click here for a gallery of the relevant advertisements. â€œOur video roots are in theatrical movie marketing and what better a nod from the industry than eight of the top 10 grossing films using our products and services,â€ said Chris Young, executive vice president of rich media for DoubleClick.